The Los Angeles-based video gaming clipping service Medal has made its first acquisition as it rolls out new features to its user base. The company has acquired the Discord -based donations and payments service Donate Bot to enable direct payments and other types of transactions directly on its site. Now, the company is rolling out a service to any Medal user with more than 100 followers, allowing them to accept donations, subscriptions and payments directly from their clips on mobile, web, desktop and through embedded clips, according to a blog post from company founder Pim De Witte. For now, and for at least the next year, the service will be free to Medal users — meaning the company won’t take a dime of any users’ revenue made through payments on the platform. For users who already have a storefront up with Patreon, Shopify, Paypal.me, Streamlabs or ko-fi, Medal won’t wreck the channel — integrating with those and other payment processing systems. Through the Donate Bot service any user with a discord server can generate a donation link, which can be customized to become more of a customer acquisition funnel for teams or gamers that sell their own merchandise. A Webhooks API gives users a way to add donors to various list or subscription services or stream overlays, and the Donate Bot is directly linked with Discord Bot List and Discord Server List as well, so you can accept donations without having to set up a website. In addition, the company updated its social features, so clips made on Medal can ultimately be shared on social media platforms like Twitter and Discord — and the company is also integrated with Discord, Twitter and Steam in a way to encourage easier signups. Hot on the heels of the wonderful NES.party comes Haukur Rosinkranz’s SNES.party, a site that lets you play Super Nintendo with all your buds. Rosinkranz is Icelandic but lives in Berlin now. He made NES.party a year ago while experimenting with WebRTC and WebSockets and he updated his software to support the SNES. He said it took him six months to build the app and a month to add NES support. “It’s hard to say how long it took because I basically created my own framework for web applications that need realtime communication between one or more participants,” he said. He is a freelance programmer. It’s a clever hack that could add a little fun to your otherwise dismal day. Feel like a little Link to the Past? Pop over here and let’s play! The Opera Android browser will soon be able to hold your cryptocurrencies. The system, now in beta, lets you store crypto and ERC20 tokens in your browser, send and receive crypto on the fly, and secures your wallet with your phone’s biometric security or passcode. You can sign up to try the beta here. The feature, called Crypto Wallet, “makes Opera the first major browser to introduce a built-in crypto wallet” according to the company. The feature could allow for micropayments in the browser and paves the way for similar features in other browsers. 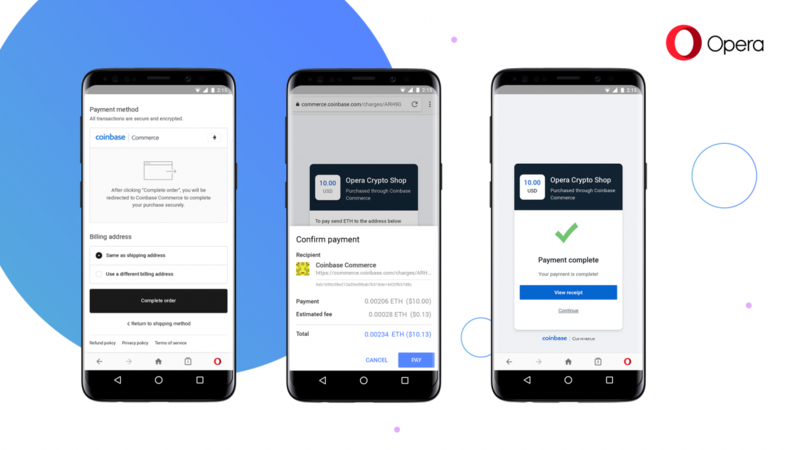 In addition to being able to send money from wallet to wallet and interact with Dapps, Opera now supports online payments with cryptocurrency where merchants support exists. Users that choose to pay for their order using cryptocurrency on Coinbase Commerce-enabled merchants will be presented with a payment request dialog, asking them for their signature. The payment will then be signed and transmitted directly from the browser. While it’s still early days for this sort of technology it’s interesting to see a mainstream browser entering the space. Don’t hold your breath on seeing crypto in Safari or Edge but Chrome and other “open source” browsers could easily add these features given enough demand.